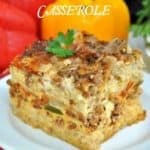 A delicious and easy breakfast casserole made in the slow cooker. Spray a 6-quart slow cooker with cooking spray. Place half of the hash browns, sausage, onion, peppers, and cheese in the prepared slow cooker. Repeat layers, ending with cheese on top. In a large bowl, whisk together eggs, milk, Italian seasoning, salt, and pepper. Pour egg mixture into the slow cooker.